The drops are already making the game very dynamic, but there is one more important rule called promotion. The promotion rule together with drop rule make pieces advance and get stronger quickly. Those “camps” are actually called promotion zones and contain last three rows. Most of the pieces can promote, but you only have to remember 3 last patterns of the movements. Promoted silver, knight, lance and tokin all move like the gold. 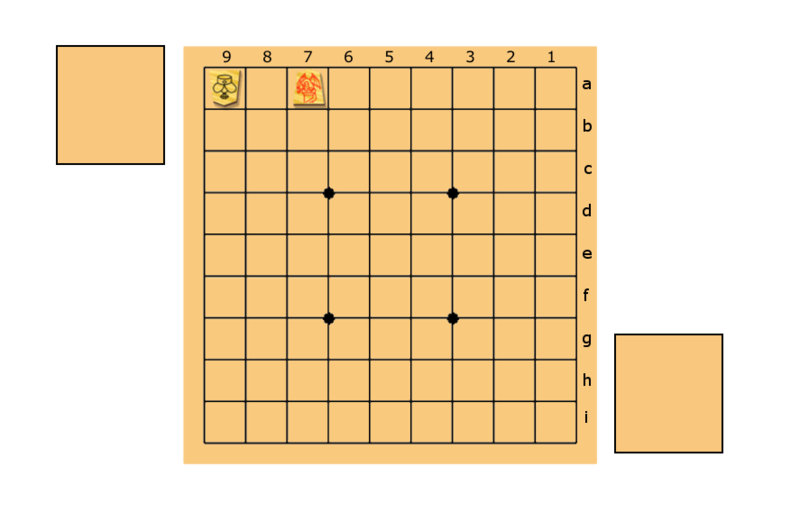 King and gold cannot promote (you can see on your shogi set that their back is blank). Answer: The only safe square is 3c. Silver to 3c with promotion. Answer: Here comes the dragon! Rook promotion to 7a! Check! Notice that the dragon covers the square 8b as well. Promotion problem 3 – should you promote or not? Answer: No! fork is much better option. Remember, the promotion is only optional. You choose which move to play – unpromoted or promoted. The promotion does not disappear until the piece is taken off the board. Example – the dragon is taken off the board and becomes the rook. Let’s learn about illegal moves before the final quiz.